Open 8:00am - 5:00pm all December. - Closed on Christmas! Click here to get your Pick Your Own Baskets! Yes, you read it correctly; "Murray" Christmas on the Farm. This play on words has been a holiday slogan for many years at the Murray home. We hope that you and the rest of our "Family Farm Fanatics" would get a kick out of it too! Bring your family out for our on-the- farm Christmas and start a new holiday tradition. Take a "Hay"cation while you sing Christmas carols on our decked out tractor drawn "Sleigh" wagons. You'll chuckle when strolling through our "Giant Santa Story". Eight foot tall Santa figures portray a one of a kind story that is bigger than life, telling the tale of how Santa got fit on the farm. Pick out the perfect tree. 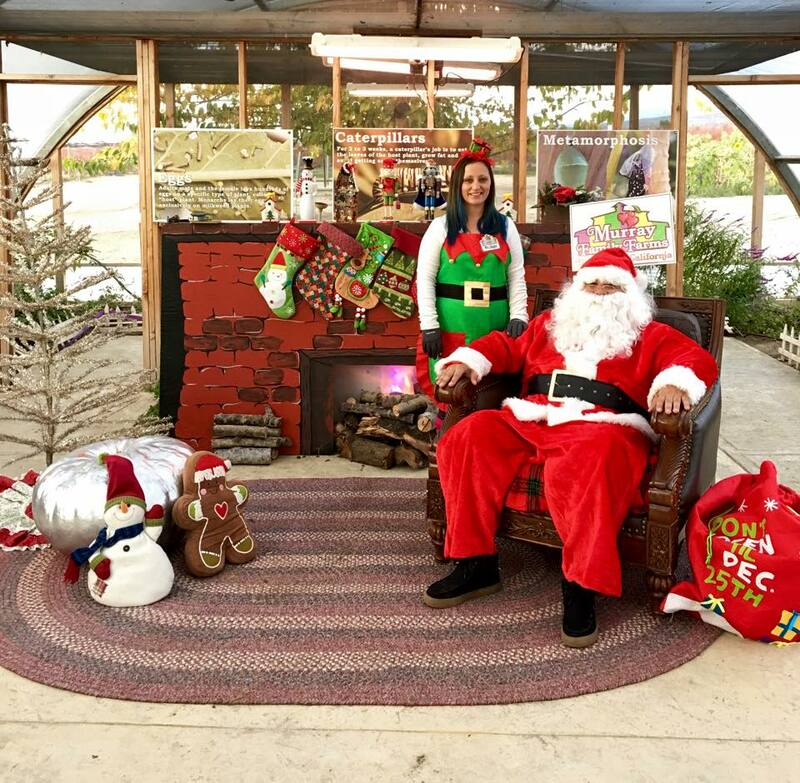 take your picture with old Saint Nick, enjoy a cup of hot chocolate or apple cider while roasting marshmallows over an open fire. ”Ho ho ho! Well, It’s a bit embarrassing you see… “ Santa proceeded to tell us all about his troubles. Too many cookies, too much time off! He had been making toys and packing boxes for so long that it took him barely any effort anymore and it was starting to show. Naturally, we helped out and we’re glad we did. Ever since that day, Santa brings just a little extra Christmas cheer to our farm each year. Once October begins to end, Scarecrows toss off straw hats and don red suits, becoming Cheercrows. Even the Cactus get in on the fun. To commemorate that special day in farm history, we open up a storybook tale underneath the pole barn where our jolly giants present that very story. Join us as we continue to put on the Farmiest Float in the Christmas Parade! Mistletoe was born on Christmas day and when the other kittens saw him...they all ran away. Mistletoe had given up hope of ever having a home, but when he finds three little lost kittens his unselfish acts of kindness and a surprise gift from Santa change all that. Join us during Christmas on the Farm to read the tale of Mistletoe in our flower maze. The benefits of reading with your children are just too many to list here, and that’s why we thought it would be important to give parents the opportunity to take time to enjoy reading with their little ones. Use this arrow to explore! Stroll through the hand painted concrete tunnel into the lush and beautiful Auntie Annabell’s Animal Garden. Brimming with beautiful flowers, abundant foliage, and flocks of friendly critters. Don’t miss the old time “water pump rubber ducky races” now located in the animal garden. Watch your children play in the plastic ball pool while enjoying the shade in our central court with turtle doves cooing in the background. Meet boar crosses, pygmies and kidder goats! We have amiable sheep and the very sweet but sassy miniature horse, and you can pet them through our sweet little petting windows for one on one time! Please don’t forget to use our darling “sink go round” and wash your hands with soap and water. Animal feed stations are located in 3 areas of the garden to delight children and critters alike. Feed pellets take quarters, so don’t forget to bring change! Right next door to the Animal Garden you’ll find our 1,500 square foot peacock hutch and Aviary. The happy royal blues holler loudly, court, strut, and show their beautiful plumage. in the Aviary, you’ll find a collection of hundreds of Tropical birds and unique chickens. All of our birds are bred here naturally and not taken from their home in the wild, as not to upset the balance of nature. Being around humans their entire life, these birds are friendly and happy to meet all the new friends visiting the farm! Summertime Sled! This Children’s Barnyard Toboggan Hill utilizes cardboard on synthetic grass to exhilarate youth of all ages. Bigger than most, this hill is nearly 40 feet tall, sloping from a 10 foot high center! Pictured here is Red enjoying Mount Murray during Dog Days on the farm! It's the one special day of the year where you can enjoy farm life with your adorable furry baby! Little kids, teenagers and “some” big kids (sorry, weight limit is 220 lbs) all love to jump on our giant bounce pillow. A Kern County exclusive, this 60 foot by 80 foot inflated pillow is placed halfway into the ground. Keep your head in the clouds and your feet off the ground, but stay safe! This recent attraction is 60 feet long and has aim and shoot bulls-eyes for baseball, football and basketball. Practice your arm with one of America's pastimes! Can you throw a perfect spinner? The Barnyard Ball Toss is simple fun, especially if you have a competative streak! Our Butterfly House is one of the most magical experiences on the farm. A magnificent exhibit of the full lifecycle of the Monarch Butterfly. You can find Larvae, Chrysalis, and fully developed butterflies during the Fall at Murray Family Farms. Sadly, the Butterfly House is only available during October. Unless it's October right now, then you're one lucky son of a plum! Though legend has it, Santa sets up residence here in December. Have you ever wondered what farms do with all those corn cobs from the Corn Maze each year? You've got to see this. Our Corn Cannons shoot corn cobs using compressed air and metal tubes. Take on the Great Pumpkin in a battle of the barrels. Can you knock his garden tool smile back in line?! Old Mr.Murray had a farm, eeii eeii oo, and on the farm he had a purple sheep... Oh wait, that's the kiddie train! The kittie train is the most adorable way to get around the farm. Available only on weekends, if you don't have a picture of your tot on this ride you are missing out! Each of our cuddly Animal Garden friends brought to life from painted barrels to offer the ponyride of a lifetime. Our tractor drawn wagon rides are packed full of sights and sounds of a working farm as they traverse 43 scenic acres of cultivated crops. View the surrounding citrus groves, golden foothills, yellow roses, and the Tehachapi mountain skyline on top of a hay wagon. Our tour guides are outgoing, informative, and down right funny. Visitors get to sample what’s ripe for the picking, and learn about local points of interest, our farming practices, fruit facts, nutrition, and the surrounding agricultural splendor. Stops are made along the way to observe farming activities and to pick up U-Pickers. Hayrides run Saturdays and Sundays only, or with a scheduled tour.